Long Islanders looking for a sharp new compact crossover sport utility vehicle (SUV) will probably find that their top choices come down to just two vehicles: The 2018 Toyota RAV4 and the 2018 Ford Escape. An SUV should offer drivers multiple things, including (but not limited to) functionality, reliability, and ample room for both passengers and cargo - stuff that the RAV4 has in spades when compared to the Escape. It’s not always about what’s on the inside, though, and both SUVs have different, distinctive silhouettes. 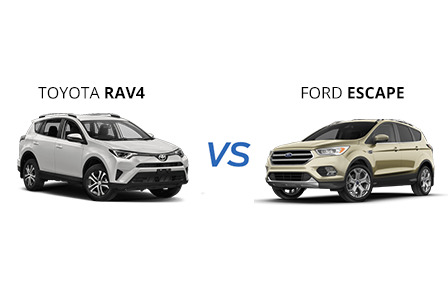 Shopping for a new vehicle (regardless of type) is about finding the perfect blend of interior features and exterior appearance, and that’s what makes the decision between the new RAV4 and the new Ford Escape such a tough one for buyers. At Westbury Toyota, it’s our mission to help you find the vehicle that will suit your lifestyle best. We think it’s imperative to be able to match every customer with the car of their dreams, and to that end we want to share some of our knowledge about how to make comparisons between cars to sort out which one offers everything you need. With this in mind, we'd like to invite you to read on and discover exactly what’s so great about the 2018 RAV4 and all of the reasons why we think it has more than an edge up on the 2018 Ford Escape. To kick off 2018, Toyota has released a new trim level for the RAV4: the Adventure. As Andrew Newton of Car Gurus explains, the Adventure was designed for those who sometimes want to explore Long Island off the beaten path and subsequently offers up a raised suspension for more ground clearance and bigger, tougher wheels. The Escape, while having a sturdy build and intrepid name, has more to offer as a hatchback than it does as an off-road vehicle, only offering all-wheel drive (AWD) as an option while both AWD and front-wheel drive (FWD) are standard choices on the RAV 4. Also new this year for the RAV4 is the Cold Weather Package, which gives drivers a number of cozy conveniences that anyone who has lived through a nasty Long Island winter is sure to appreciate. This package includes heated seats, a heated steering wheel, and a de-icing system for the windshield wipers, all of which will make your cold winter commutes far less of a headache and considerably more manageable. The fierce competition between the RAV4 and Escape continues when you compare what they’ve got going under the hood. The Escape has a 2.5 liter (L) 4-cylinder engine that will get you 168 horsepower (hp) and 170 pound-feet (lb-ft) of torque. In comparison, the RAV4 has a 2.5 L I-4 engine that, along with a six-speed automatic transmission, puts out an impressive 176 hp and 172 lb-ft of torque. In terms of mileage, the RAV4 is the undeniable king: As Car Guru’s Andrew Newton goes on to explain, the Escape has some pretty unimpressive fuel economy, coming in at 21 miles per gallon (mpg) city driving, 29 mpg on the highway, and 24 mpg combined. In FWD the RAV4 can get 23 mpg while driving the streets of Westbury and 30 mpg when cruising the highways. If getting decent mileage is important to you, it’s pretty clear which vehicle is the best choice here. The editorial staff at NewCars.com says it best: One of the most popular things about the RAV4 is that it gives you a lot of cargo capacity without having to sacrifice anything else. With all rows of seats upright, you get 38.4 cubic feet of cargo volume and with the split rear row of seats folded down, you get 73.4 cubic feet of volume. These are impressive numbers, particularly when compared with the Escape, which only gets you 34 cubic feet with the seats up and 68 cubic feet with the seats down. As anyone with a busy lifestyle knows, sometimes you need all the extra room you can get in a vehicle, especially if you’ve got a family that comes with a lot of luggage in tow on a day-to-day basis. If having that extra room in the back is a must-have item on your new car checklist, the RAV4 fits the bill. Shopping for a new vehicle can be way more stressful than it needs to be, and that’s why our staff members here at Westbury Toyota want to do everything they can to make this task easier on you. It’s never just as simple as pointing to the car that looks nice and making your decision - there are so many other factors you need to consider, including things like utility, convenience, and most importantly, affordability. When you’re paying for a new vehicle, you want to be sure that you’re choosing the car that gives you the biggest bang for your buck because it’s an investment for you and your family and you want to make sure that it pays off in the long run. Obviously we at Westbury Toyota are a little biased, but the numbers don’t lie. The RAV4 not only provides better fuel economy than the Escape, it also gives you more power under the hood and a lot more cargo space. Not only that, but the RAV4 is the better vehicle for people who like to blow off steam by off-roading every once in a while. This means that if you’re looking for a compact crossover SUV that can work hard both on the city streets and off, saves you money with its fuel mileage ratings, and can function perfectly as a family vehicle too, there’s only one clear winner between these two options: The 2018 Toyota RAV4.